Will the Yellow Pages industry be the next business category to suffer its demise at the hands of the internet? Today’s Wall Street Journal has an interesting overview of the state of the Yellow Pages industry. Will the Yellow Pages go away anytime soon? Will 50% or more of the existing Yellow Pages advertising supply disappear in this economic cycle? Will the Yellow Pages industry as a whole ever experience the semi-monopolistic product and pricing power it once enjoyed? The most interesting figure to come from today’s Wall Street Journal article about the Yellow Pages industry is the graph showing the internet audience size of the top providers – MapQuest / AOL, Superpages.com / Idearc, Yellowpages.com / AT&T, Whitepages and Yahoo Local / Yahoo. Collectively the group has less than 150 million unique visitors monthly. How many more unique monthly visitors would the Yellow Pages industry need to become competitive? Will the industry have time to amass a large enough internet audience to offset the losses occurring from a contraction in buyers and the continued erosion in their print audience? The Yellow Pages industry could do what the auto industry does when its products and cost structures no longer generate profits – turn to Washington. 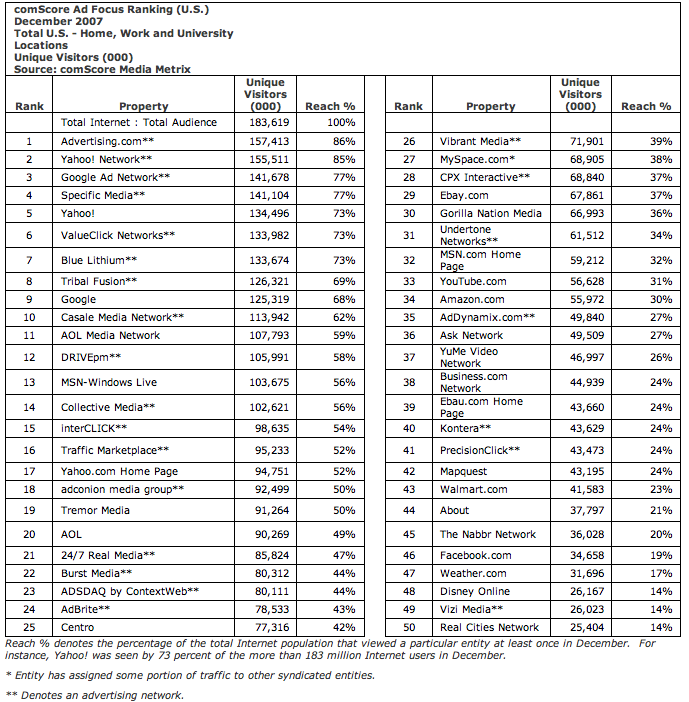 comScore has released its August 2008 qSearch analysis of the the U.S. search marketplace. According to comScore, Google core search sites continued to lead the U.S. core search market in August with 63% of the searches conducted, up from 61.9% in July. Yahoo core search sites had the second largest amount of search traffic with 19.6%, followed by Microsoft with 8.3%, the Ask Network with 4.8% and AOL LLC with 4.3% of searches conducted. At the top web properties where search is observed, Google web properties led with 10.2 billion searches followed by Yahoo web properties with 2.4 billion searches, Microsoft web properties with 1 billion searches and AOL LLC and it search sites with 839 million search queries. What I found most interesting in the comScore top web properties search data was Fox Interactive’s web sites – including MySpace.com – conducted 593 millions searches compared to Ask Network’s properties 572 million searches. 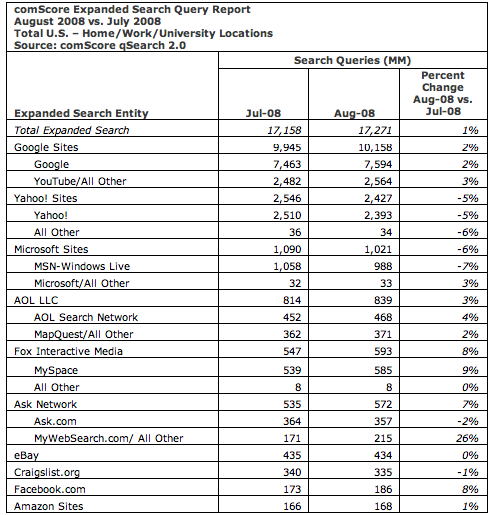 Also, according to comScore data and to my surprise, MySpace.com has even surpassed AOL’s Search Network – not including MapQuest – fielding 117 million more search queries per month than AOL search. Even with MySpace network’s growth slowing, at some point won’t its user base and growth cause it to generate an equal and then ever increasing number of search queries per month? At its present size and barring any significant search market disruptions, will MySpace.com eventually generate more searches per month than AOL? Ultimately, will MySpace.com generate more search queries per month than even Microsoft’s web properties?